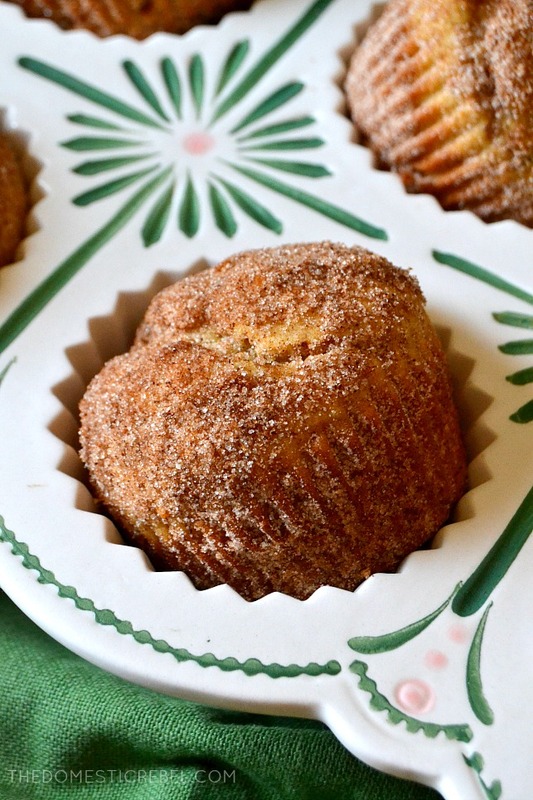 Soft and tender with a fluffy, cake-like interior, these Churro Donut Muffins are extraordinary! 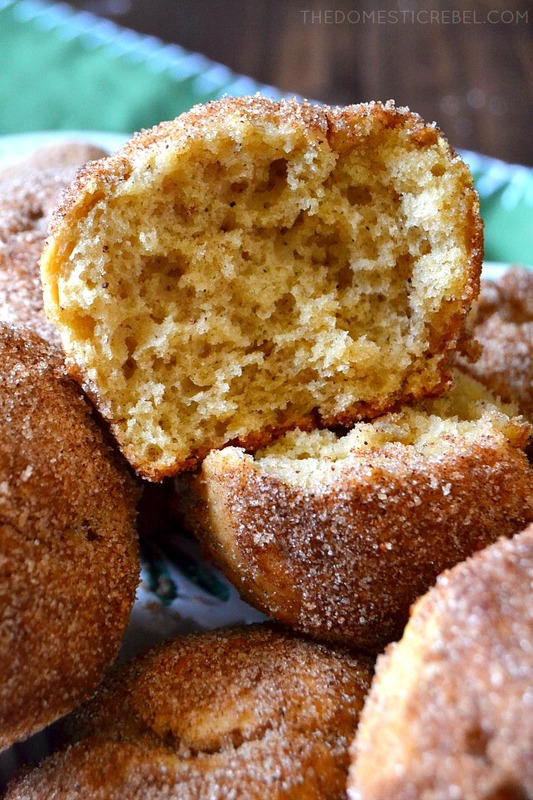 So much easier than frying a batch of doughnuts but with the same bakery-style flavor we all love. So some of you know, but I got a part-time job at my friend’s clothing store recently. I wanted some extra cash when traffic to my blog is slow (don’t leave me! ), and because I love my friend and I love her store and I love to shop, I figured it was a natural progression for me to work there. But I seemed to have blocked my retail experience in my mind as a self-preservation/survival technique and was rudely welcomed to my re-entrance to that world. We get some … interesting customers. What I really love, though, is that I get to shop all day basically. I get to flick through the racks to find clothes to dress our mannequins. I get to buy used clothes (we’re a secondhand shop) and see what people wear (and how gross people can be), and I get to go through our amazing vintage collection and swoon. So naturally, I’ve made zero money from this job because I turn around and spend my paycheck on plus-size vintage goodies which are surprisingly hard to find. It’s like people in the 60s weren’t a size 18, and when I do score some cool mod housecoat that fits everywhere, the arm holes are like 2″ wide. Seriously, I feel like the Hulk trying to fit into a daisy-print babydoll dress with my Dwayne Johnson-size arms busting through this retro masterpiece like I’m molting my (fashionable) skin off. Anyway. 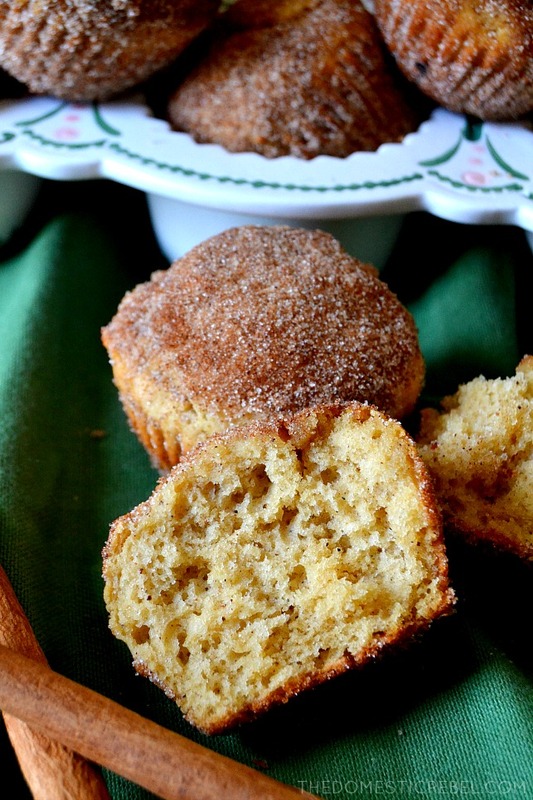 Speaking of vintage, this recipe for Churro Donut Muffins is kinda vintage because I posted something very similar many years ago. While that recipe was (and still is!) delicious, I think I prefer this churro donut 2.0 recipe better. This recipe is different than say, a blueberry muffin recipe because it’s more lighter, fluffier, and has a cake-like texture than your average dense muffin. There’s no dryness and no lack of flavor, thanks to the cinnamon sugar crisp topping and the nutmeg in the batter. If you’re wondering, ‘nutmeg?’… nutmeg is a secret ingredient in most bakeries. 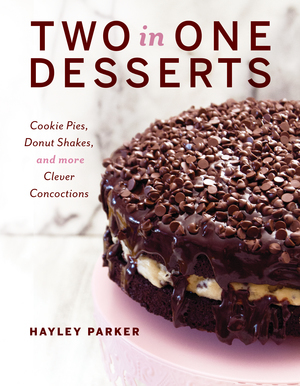 It gives doughnuts that doughnut shop flavor everyone craves and adds a little je ne sais quoi to the batter, making it taste more authentic. Don’t skimp on the nutmeg! …or that cinnamon sugar topping. SWOON. 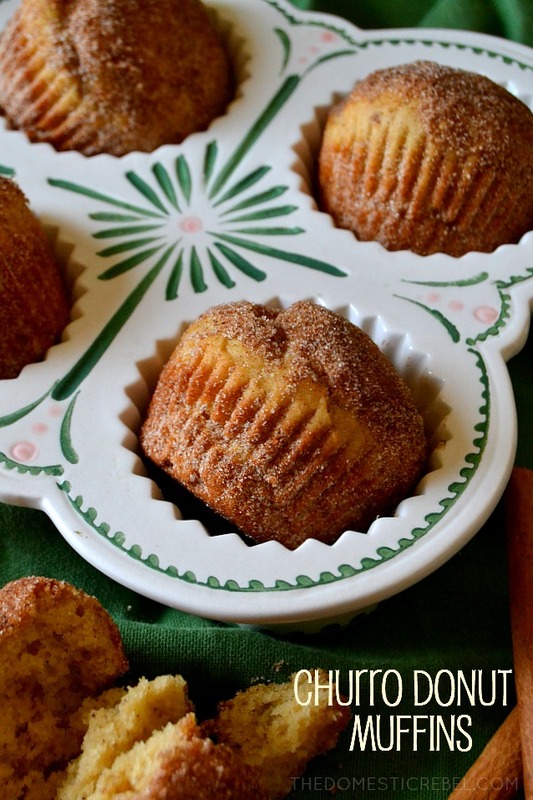 These Churro Donut Muffins are so sinfully delicious! Light, fluffy and moist with a tender crumb that tastes like these came from an upscale bakery. The crisp cinnamon sugar topping is to-die for and really brings home that authentic churro flavor. Preheat oven to 425 degrees F. Line a muffin pan with 12 paper liners or grease the muffin cavities with butter or cooking spray. Set aside. In a large bowl, cream together the softened butter, oil, granulated sugar, and brown sugar with an electric mixer until combined. Beat in the eggs, one at a time, followed by the vanilla extract. Stir in the nutmeg, baking powder, baking soda, and salt. Add a little bit of the flour, followed by a little bit of the milk, mixing until just combined after each addition and ending with the flour. Mix until just barely combined - overmixing will result in tough muffins! Portion the batter evenly among the muffin cups. Bake for 15-18 minutes or until the tops are done and a toothpick inserted near the center comes out clean or with moist crumbs. Cool for about 5-10 minutes or until cool enough to handle. Whisk together the sugar and cinnamon for the topping into a small bowl. Unwrap the muffins from liners (if using) and brush the tops of the muffins with the melted butter. 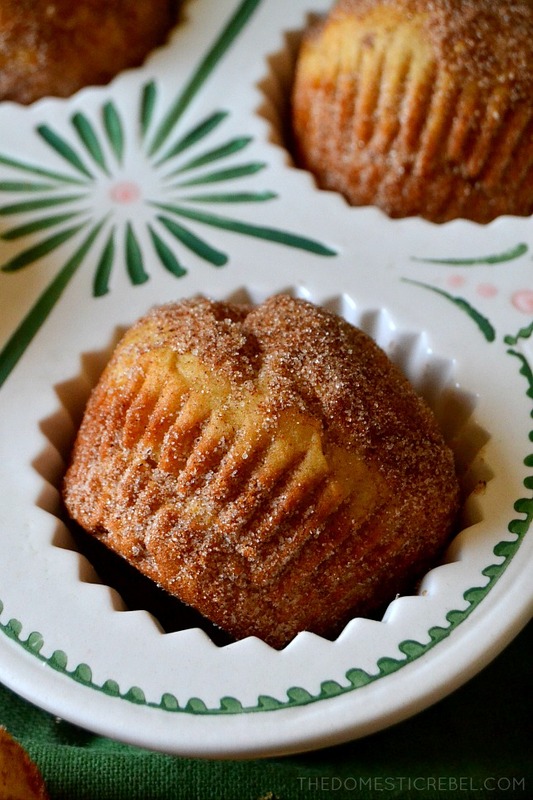 Immediately dredge each buttered muffin into the cinnamon sugar mixture until completely coated. 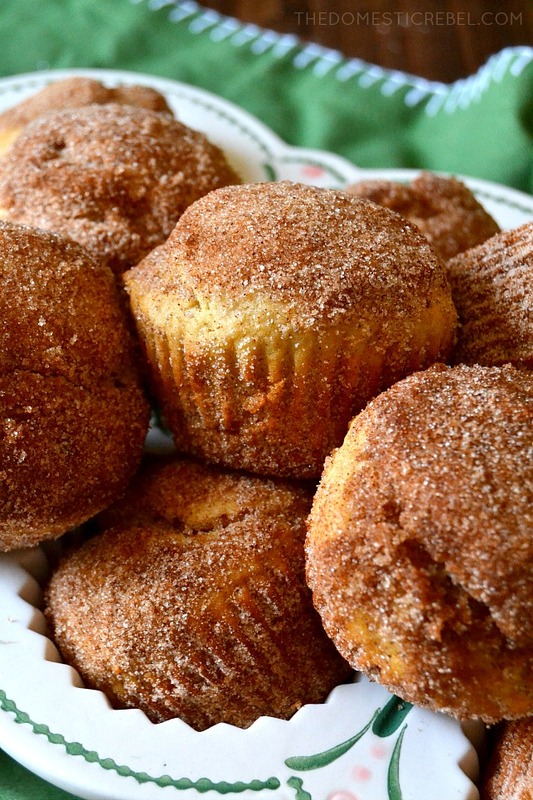 Once all muffin tops have been topped with cinnamon sugar, dredge the remaining sides and bottom of each muffin into the cinnamon sugar so the whole thing is coated. 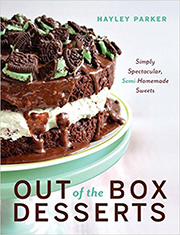 Serve immediately, or store airtight at room temperature for 2 days. 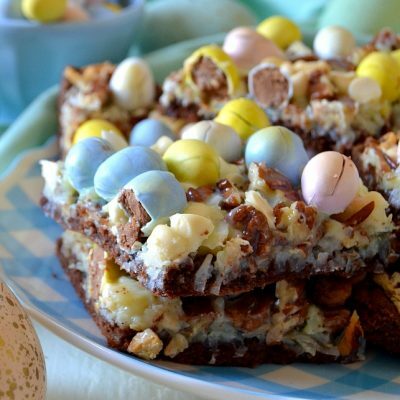 Super easy and even more delicious!